For some patients there come a time when the difficult decision to move from natural teeth to a prosthetic solution is necessary. This can be due to periodtonal (gum) disease, missing teeth, broken teeth, poor esthetics, or a combination of the above. 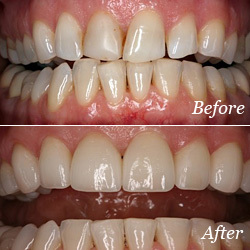 One of the most common questions patients have is will I have teeth during healing? The immediate denture is a temporary denture that is placed immediately after surgery that is used during the healing period. During the healing period, soft liners are placed (soft material placed inside the denture) to tighten the fit and cushion your bite until the healing is complete. Once the healing is complete after the extraction, a new denture is made that allows for changes in esthetics, occlusal (bite) scheme, and a brand new denture base. An immediate denture can be combined with implants to have a fixed temporary denture until the healing of the implants is complete. (See All on Four Section) In Overland Park, Kansas City get your immediate dentures on the same day.